Make Your Yard Lush with the Best Tripod Sprinkler. When you’re getting serious about your yard and garden irrigation, and need to cover big areas, you’re ready for a tripod sprinkler. Tripod sprinklers, as the name indicates, have a three-legged base that holds steady. They’re intended to cover up to 360 degrees with a freely rotating sprinkler head and have broad coverage. With an adjustable height, they allow for maximum spray range that can also reach over tall plants. After a thorough review of the market, we’ve found that the best tripod sprinkler is the Melnor Metal Pulsating Sprinkler with Tripod. The Melnor gives great results on big yards and gardens and has a solid set of built-in features. Plus. it’s covered under a lifetime warranty! Melnor produced their first oscillating sprinkler in 1948, and they still make sturdy metal products for all types of irrigations needs. For more information on the Melnor tripod sprinkler, see the Product Reviews section below. Our runner-up pick is the Orbit 56667N Zinc Impact Sprinkler on Tripod Base. Orbit’s Zinc head model has some nice features, like a broad range of adjustments, but wasn’t quite as reliable as the Melnor sprinkler in handling fluctuations in water pressure. It still does a good job with area coverage and overall stability. For a full review of the 56667N, see our Product Reviews section below. Our budget-friendly choice is the Orbit 58308 Tripod Base with Brass Impact Head. This Orbit model has some nice features for the price. It doesn’t have the longevity of the metal construction available in our top two selections. It does, however, have a convenient design for attaching the hose, and excellent base stability. For more information on the 58308, see our Product Reviews below. In this section, we’ll look closely at five of the best tripod sprinklers on the market. We’ll compare and contract each of them, and note important benefits and drawbacks. We’ll end with our conclusion and best picks. Covered under a one-year warranty. The Orbit 58308 is a tripod sprinkler with a good range that should be able to handle most yard or garden spaces. It was is our Budget Pick, due to its solid feature set and great price point. 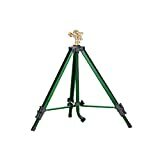 This tripod sprinkler has an angled “gooseneck” attachment for the hose at the bottom of the tripod. This attachment point swivels, which means that it’s much easier to attach the hose when the tripod is already set up — no need to rotate the whole unit around just to get the hose connected. The connections are brass, as are all the fittings on the sprinkler. Pair this sprinkler up with a garden hose timer, and you’ll be able to automate a good deal of your watering needs! The height adjustment is up to 4′, which is great. This amount of adjustment offers the ability to spray over almost any plants in a garden. Users should note that it is easy to adjust for height, using the clamps on each leg. One can set the height for any point between the 25-48” range this way, and the legs can be adjusted independently to accommodate uneven ground. The tripod is metal, and the legs are weighted. This is an important feature when the sprinkler is actively spraying and helps keep things stable. That said, the 58308 does not have quite the stability as some of our other units, but most find that it is good enough. The spray head can be adjusted for stationary or rotating use of up to 360 degrees. The sprinkler and can cover up to 100 feet. Adjustments are made with a tab on the sprinkler head. It handles pressures up to 80 psi. The chart below gives a decent sense of the spray radius, depending on the pressure going into the sprinkler. The main issues noted were with the plastic that holds the actual sprinkler head, and with use in hard water areas. The plastic, some find, doesn’t hold up to several seasons worth of use. The sprinkler head, like a lot of plumbing in hard water areas, can become clogged, and may need some occasional cleaning and maintenance to keep it rotating freely and spraying at the water pressure needed. Many find that something like CLR Hard Water removal system will help keep the sprinkler head working properly. Overall, the Orbit 58308 is an excellent tripod sprinkler and is a great choice for those who want a tripod sprinkler but don’t want to break the bank. It has a good range and a solid build. LARGE-AREA COVERAGE: Sprays up to 90 feet in diameter, covering 6,361 square feet when set to a full circle. HEAVY-DUTY BRASS: The brass construction can withstand high-water pressures and severe weather conditions without the worry of breaking, rusting, or failing. ADJUSTABLE COVERAGE: Easily adjust spray coverage from a partial section to full 360° watering. CUSTOMIZABLE SETTINGS: Use the deflector shield and diffuser screw to alter the stream and change the spray distance radius anywhere from 20 to 45 feet. ANTI-BACKSPLASH ARM: Improves the sprinklers ability to spray water in a consistent pattern and in the desired direction. Covered under a lifetime warranty. 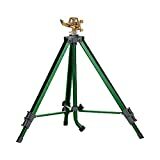 Melnor’s Metal Pulsating Sprinkler has an extremely sturdy tripod base, a good range, and gets kudos for working well with lower water pressures. It is the best tripod sprinkler among those we reviewed. The hose connection for this tripod is located at the bottom of the tripod and can fit hose diameters of 3/4, 5/8 and 1/2 inches. All brass fittings are used for the sprinkler, other than the metal impulse head. Most find that adjusting the sprinkler head and using the sprinkler is super easy, which makes this a winning product. It is completely adjustable and ranges from a stationary position up to the full 360-degree spray pattern. The angle of the spray can also be adjusted, giving the sprinkler a lot of versatility. Spraying radius is adjusted on top of the sprinkler head with tabs. Many buyers who have to deal with low-pressure water circumstances nave noted that this unit performed particularly well with lower water pressure, continuing to rotate freely. Like all units used with mineral-rich water, though, it will benefit from occasional cleaning and maintenance to remove any deposits that could obstruct water flow or free movement of the sprinkler head. Like the Orbit above, a hard water cleaner like CLR will help keep things flowing nicely. The tripod legs are adjustable up from 24-48”, which allows for less water loss in breezy areas. This also helps it reach over those patio trees, n the middle of a garden plot. The legs sturdy and most users don’t have any issues with tipping or instability. All parts except the hinges and keepers for the tripod are metal. Like any plastic parts, these spots can break down over time, and are likely the weakest points here. However, few buyers have reported problems, even with these bits. Most problems buyers had were with the aluminum support struts that help support the main tripod legs. They do not seem to hold up to abuse as well as the main unit, so try to be gentle with them as you use the sprinkler tripod. The Melnor tripod sprinkler is an outstanding tripod sprinkler, capable of sending water where you need it without much difficulty. It is covered under a lifetime warranty, which can’t be beat, and it works very well. The Melnor is the best tripod sprinkler around, and should be your first stop in your shopping quest! The Gilmour 167TRI Large Coverage sprinkler has some nice features but suffers in some critical areas. This sprinkler has a lot of adjustment options, and, as the name implies, is meant to cover large yards effectively. It can be adjusted to an impressive height of 58”, and can be set to cover up to a 108-foot circle. That’s all fantastic, and bests much of the competition in specs. The legs are each independently adjustable for height, which is intended to help the tripod be more flexible with where it’s placed on uneven ground. However, this same feature has caused some buyers to warn of pinched fingers and a lack of sturdiness in the legs. There is no center bracing on the tripod, which leads to bent legs and instability. Just look at the picture of the Gilmour above, and compare to the other tripods on our list, and you’ll see the stability issue. The sprinkler does have spiked feet to help with placement, the plastic has a tendency to break over time, so be careful with these spikes. The sprinkler controls are easy to use and are located on the top of the metal propeller head. They allow the range and degree of the water to be adjusted with a fingertip. Unlike some lower-priced units, this unit does not feature brass fittings, and there have been issues with breakage and stripping of the threads. Be gentle attaching and detaching the garden hose (we love Flexzilla) to this one! Users do report that the Gilmour unit does well with covering large yards (the manufacturer states up to 5800 sf of coverage), but that the plastic that holds the sprinkler head to the base has a tendency to break off completely. All in all, this sprinkler does not measure up to the potential of its features, especially for the price. Gilmour has some pretty solid products on the market (the Gilmour soaker hoses are quite nice), but we have some reservations with this sprinkler tripod. The lack of a central tripod stabilizer and high amount of plastic present make this sprinkler a little questionable. If it’s available for a low sale price, it may be worth picking up, but otherwise, it’s almost certainly better to spend a bit more on a higher quality model. Sommerland has made a good sprinkler that is perfectly fine for most yards but lacks the power of some of our top-rated units. A nice feature of this sprinkler is the heavy-duty brass sprinkler head. There are many gardeners who swear by their brass items – if you’re one of them, keep this unit in mind. It is fully adjustable from a stationary position to up to 360 degrees. The range is adjusted via tabs on top of the head. The height is not as generous on this unit, ranging from 16-37”. If you’re dealing with a garden or many patio plants, you will not receive as much versatility that is offered by some of the other sprinklers we reviewed. However, for straight yard watering, it will be just fine. Pair it with a WIFI water timer, and it’s great for typical lawn use. The legs are independently adjustable and sturdy. The unit has small plastic feet that might help with stability on a hard flat surface, but probably would not be of much help in the grass. Many find that the sprinkler head performs well, but does not have the distance that the manufacturer claims. This lack of range makes it unsuitable for those who wish to cover large areas without needing to move the sprinkler. That’s kinda the point of a tripod sprinkler! The Sommerland uses fewer plastic connections than some of the other units we reviewed, but still uses plastic for the main hose point. The unit arrives with some assembly required, but it is minimal – the head must be placed onto the tripod stand. Like any sprinkler, the Sommerland performs best when occasionally cleaned and lubricated. This will remove any hard water mineral deposits that could jam the head, as well as keeping the brass fittings protected and free to move. A hard water cleaner like CLR can be effective. The Sommerland is a good basic tripod sprinkler but is not as versatile as our other choices. It’s reasonably well built, but it doesn’t have the range for really large yard and garden areas. The Orbit 5667N Zinc Impact Sprinkler is reliable and sturdy. It has a great range of features that add stability and versatility. This feature set resulted in the 5667N being our Runner-Up choice. This is the only unit we reviewed that has a zinc head. Zinc heads are generally considered inferior to Brass heads, though in the case of this sprinkler, very few buyers felt the head construction had any impact on durability. However, the material choice bears mentioning. Otherwise, the impact style head works well and covers yards effectively, with coverage being just as promised by the manufacturer. The adjustments are all done on the sprinkler head, with the range being set with a small metal plate. This is a little different than the others reviewed, and most find it reasonably easy to use and control. That said, some felt it was harder to use than the type that use the tabs to adjust the cycles. The Orbit 5667N allows for fine adjustments all the way down to a 10-foot spray zone, which is good for smaller gardens. This level of precision is pretty sweet. The metal legs on the tripod are sturdy and resist tipping well. The whole unit has a height range of 16-37.5 inches, which is good for most yards but is not the largest on our list. Like some other sprinklers reviewed, it may need moving periodically to cover larger areas. Most find that the 80′ range advertised is pretty accurate, depending on water pressure. There are slightly angled feet on the tripod legs – these would provide stability on flat areas, like a sidewalk, but would not contribute much to stability elsewhere. Generally, the tripod is trouble-free. Some buyers noted problems with the screws that hold the plastic top fitting working loose and needing to be checked and tightened periodically. Hoses connect via a gooseneck fitting with a convenient angle, but the fittings are plastic and can strip more easily. Always be careful threading plastic fittings! Most of those who have to deal with hard water have found that this sprinkler handles hard water well. However, this is with the caveat that all sprinklers do need occasional cleaning and maintenance to keep working their best. In all, the 5667N provides a versatile sprinkler that should perform adequately in most yards and gardens, and the 1-year warranty is a plus. It’s a solid choice, though, in the end, it is clearly a runner-up to the Melnor tripod and its lifetime warranty. LARGE-AREA COVERAGE: Sprays up to 85 feet in diameter, covering 5,670 square feet when set to a full circle. DURABLE CONSTRUCTION: Quality zinc materials ensure it will last season after season. CUSTOMIZABLE SETTINGS: Use the deflector shield and diffuser screw to alter the stream and change the spray distance radius anywhere from 20 to 42 feet. Evaluating the best tripod sprinkler for your yard and garden should take several factors into consideration: stability, range, adjustability, durability, and versatility. Buyers who have larger yards should consider units that can be raised taller for maximum reach and ability to go over tall plants. Durability is an important item for anything that is used exclusively in an outdoor setting. Hard water can cause issues, metal can fail, and plastic can break down. The tripod stands should stay up and not topple on uneven ground or while using high water pressure. Our favorite, the Melnor Metal Pulsating Sprinkler, was our top choice for sturdiness and features, giving largely trouble-free performance with a lifetime warranty. It should be able to handle all sizes of yards and be easy to operate. Our runner-up, the Orbit 5667N Zinc Impact Sprinkler, suffers a bit when comparing its durability to that of the Melnor, but still provides a versatile range and good features for most home lawns and gardens. A good budget pick is the Orbit 58308. It offers handy features like the easy gooseneck attachment and adjustments for a nice price. It will work well with average use.